I just love easy desserts that taste fancy. 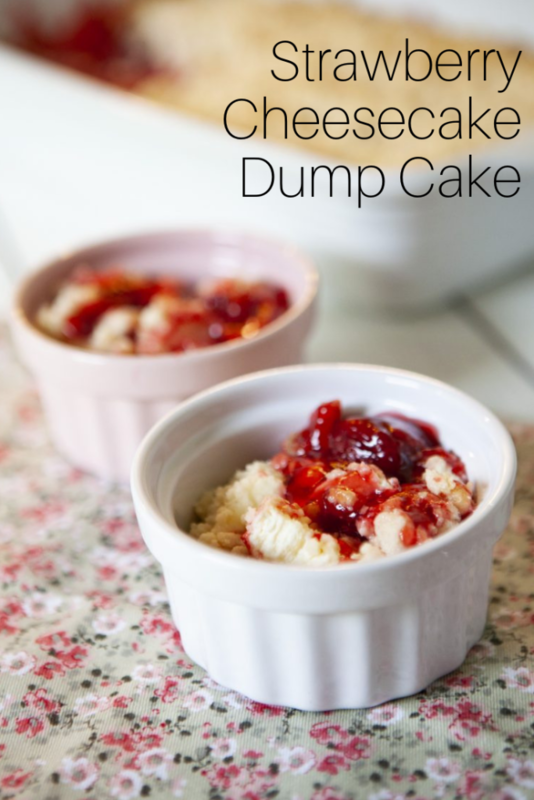 This strawberry cheesecake dump cake is that kind of dessert. It’s so easy, but feels really special. It’s something about the flavor combination. You can’t do strawberry cheesecake anything without feeling at least a little classy. 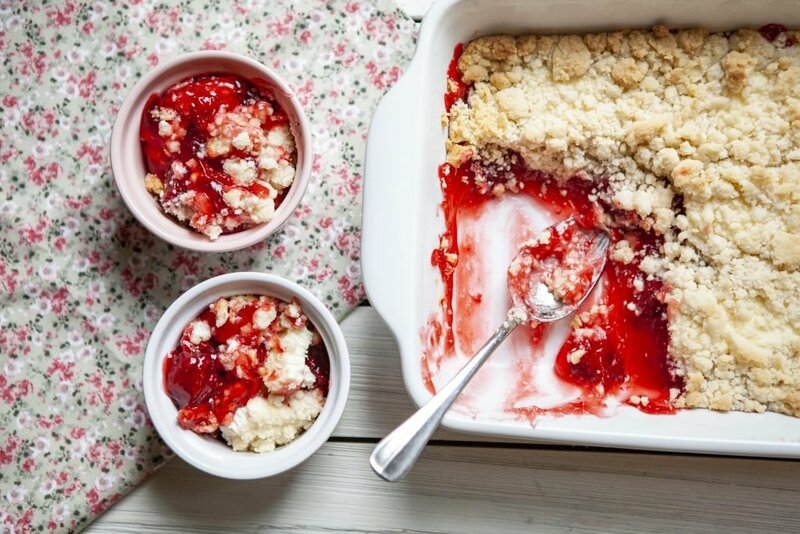 Because strawberry cheesecake is a classic flavor combination. Think about it: smooth, velvety cheesecake is classic. It’s like the little black dress of desserts. But the strawberries give it just a little extra pizzazz. They are like the fabulous necklace or the amazing shoes to perfectly compliment the little black dress. In other words, the strawberries are just a little something to jazz up cheesecake a bit. In this case, they jazz up cheesecake and vanilla cake. 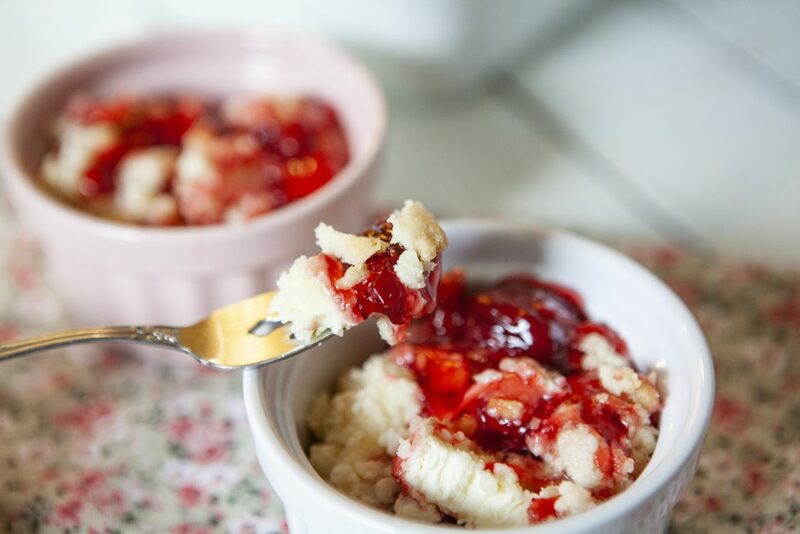 And like a great little black dress, this strawberry cheesecake dump cake is effortless. 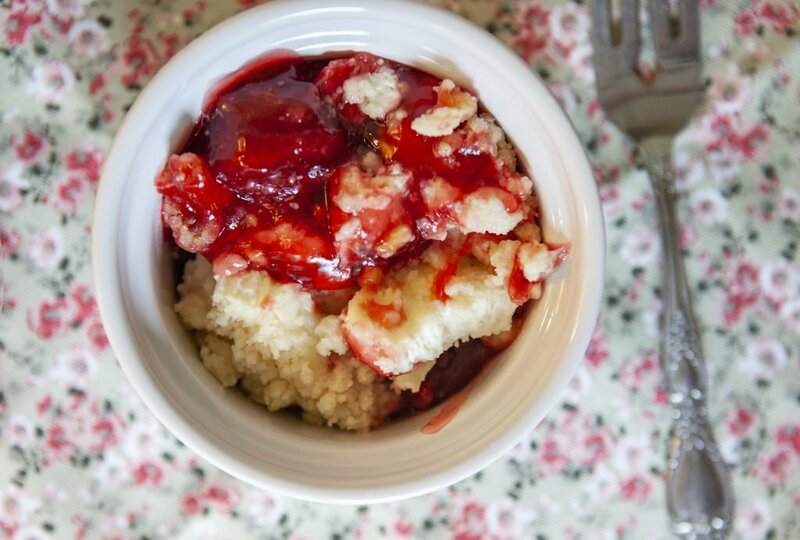 It is so easy to put this dessert together and have it turn out amazing. You just need 5 basic ingredients, one microwave safe mixing bowl, and a 9×13 baking dish. Nothing out of the ordinary. To make it, there are no fancy techniques. To start, just melt the stick of butter in the mixing bowl. Then pour in the cake mix into the melted butter and stir until the mix resembles coarse wet sand. Set it aside. After that, pour the strawberries into the greased 9×13 dish. Layer on slices off cream cheese after that. To finish, top evenly with the buttery cake mixture. Then bake at 350 for about half an hour or until the strawberries are bubbly and the top is a beautiful golden brown color. 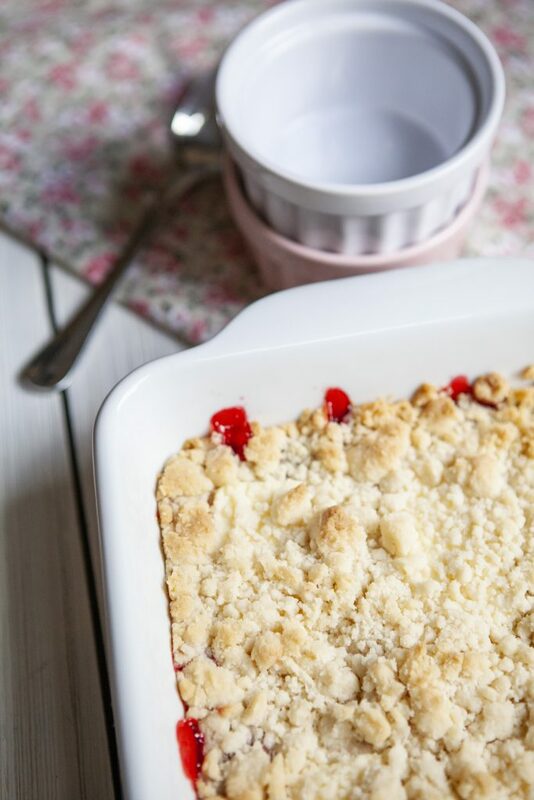 Then, if this strawberry cheesecake dump cake is for a date night at home, put on that perfect little black dress, grab your date and enjoy this perfect dessert. Spray your 9x13 baking dish with non stick cooking spray. In a medium sized bowl melt your stick of butter. Add your cake mix and mix with a fork until its well combined and has a crumbly texture. Set aside. 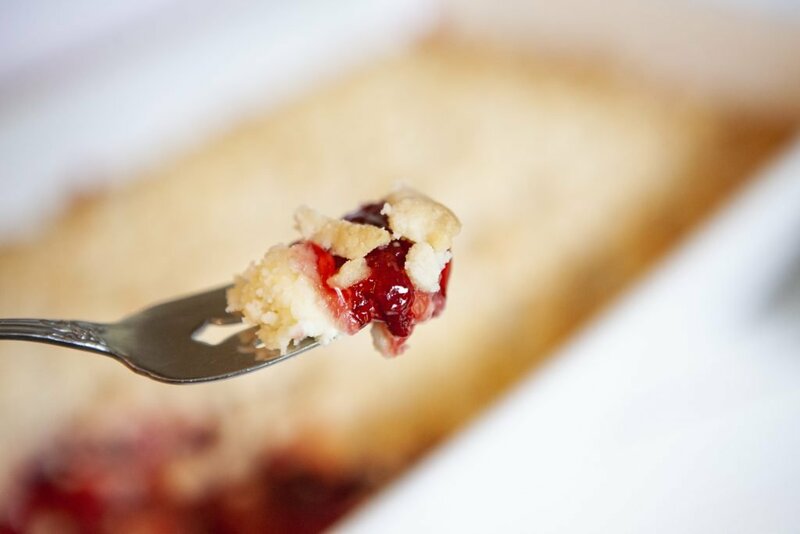 Pour both cans of strawberry filling unto your 9x13 baking dish and spread out evenly. Open your package of cream cheese and slice into thin pieces. 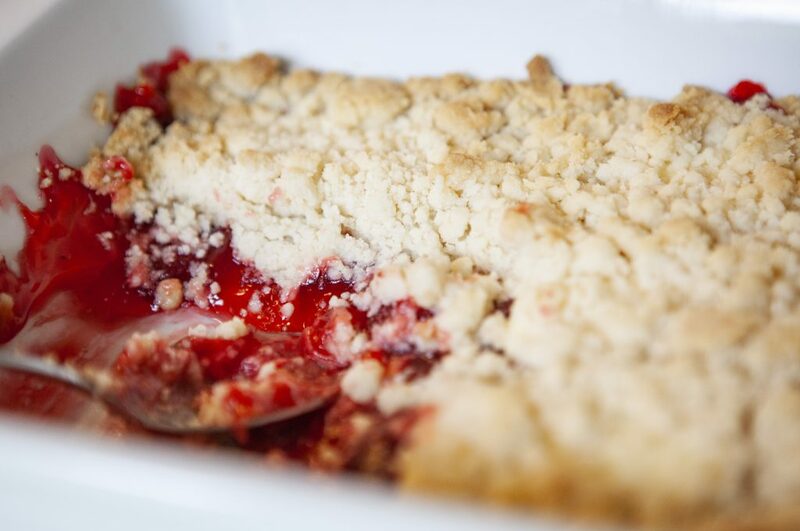 Lay each thin slice on top of strawberry filling. Pour your crumbly cake mixture on top and spread evenly. 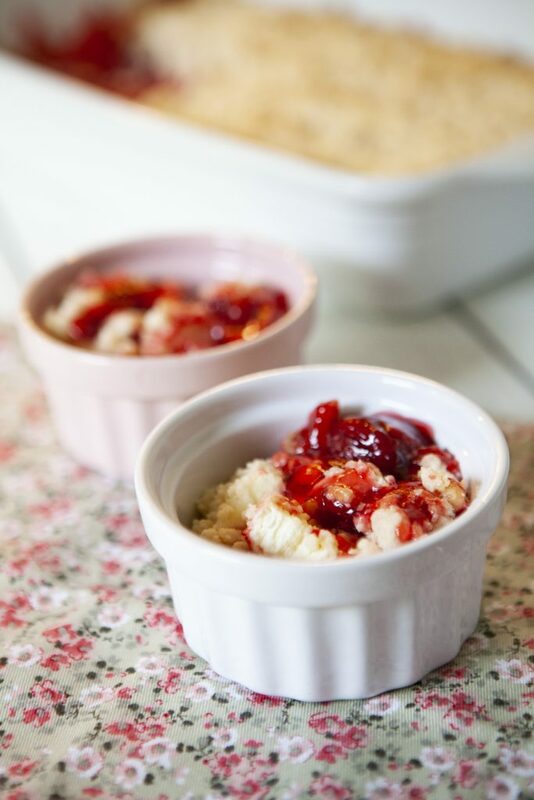 Bake for 30 mins or until the strawberry is bubbling and the top is lightly golden brown. This looks so very good! 🙂 So simple, yet so delicious. 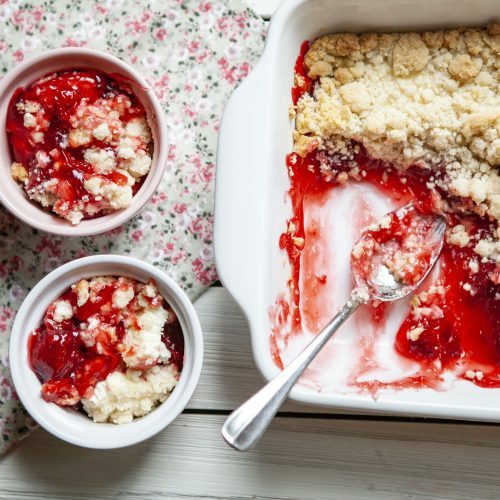 I would love to try this out, but I doubt I would be able to find strawberry pie filling here. Can I use anything else in place of that? Where are you located? Strawberry pie filling is sold in a can here in the baking aisle. I love cakes like this and it looks wonderful! Thank you for sharing at Fiesta Friday!